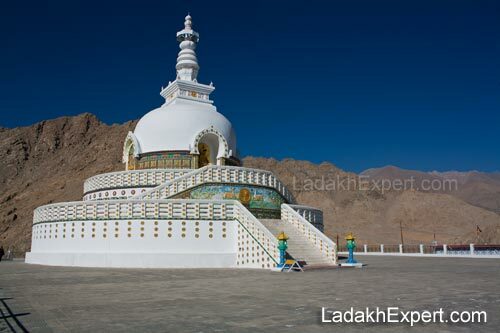 Shanti Stupa is located in Changspa Village in Leh and is a beautiful white domed stupa (chortan). Shanti Stupa was built in 1991 by Bhikshu Gyomyo Nakamura, a Buddhist from Japan and it contains relics of the Buddha at its base and was enshrined by Dalai Lama himself. It also contains photograph of Dalai Lama in its base. Since its construction, Shanti Stupa has become the must visit place in Leh and not only due to beautiful stupa and peacefulness, but also due to the fact that it provides a bird’s eye view of Leh City, which is only rivaled by the view provided from Namgyal Tsemo Monastery, which is located directly opposite Shanti Stupa, across the Leh City and is clearly visible from the stupa. 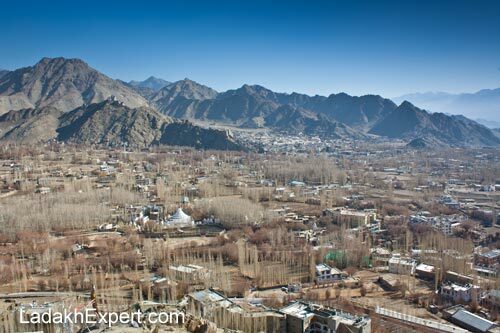 Shanti Stupa is open from 5AM to 9PM each day and is a must visit for anyone visiting Leh and Ladakh.